Order online this gift of Precious Dress To Impress Fruit Gift Hamper for your special one and show your love and affection. 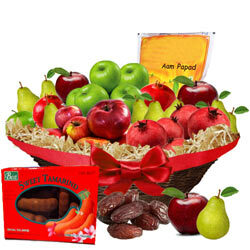 This lavish array of Festive family favorites comes with Sweet Tamarind, 1 kg. of Dates, 20 Pieces of Aam Papad Chocolate, 1 kg. of Pomegranate, 1/2 kg. of Pears, 1/2 kg. of Red Apple and 1/2 kg. of Green Apple.